Put a couple of spoons of dark brown mustard on a plate, arrange the egg halves around the mustard, and if you like, you can even add some crispy fried potatoes or potato chips. Spread a little mustard on the egg, and eat away! These things are better the second day, when they've been kept overnight in the refrigerator. 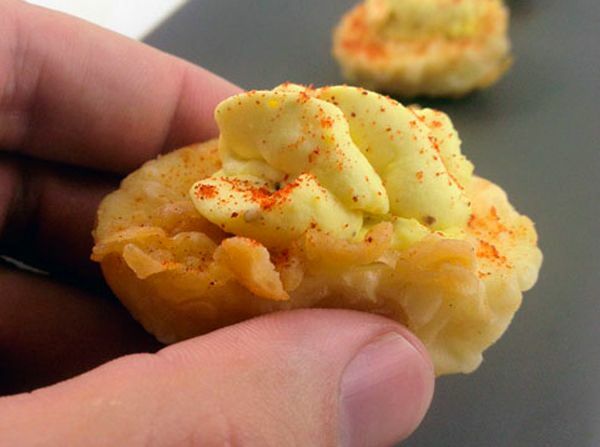 You can either warm them up in the microwave, or eat them cold.... Confession: eggs benedict is one of my favorite brunch dishes, and after trying all the creative riffs on it (country style, crab cakes, over a waffle), I truly thought I'd seen it all. Place the eggs in a small saucepan, and add enough cold water to cover them by about 1 inch. Bring the water to a boil, then reduce to a low simmer. Immediately remove eggs and cool in the ice bath. Dip eggs in flour, then egg mixture and finally into the panko. 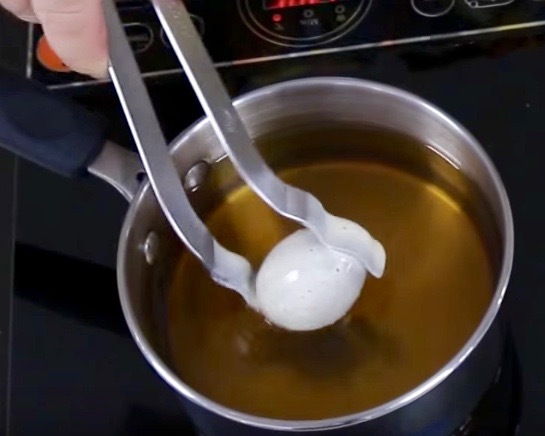 Gently drop eggs into the hot oil and fry until golden brown. Remove to a sheet pan lined with parchment paper or paper towel. Season w/ salt and pepper and garnish w/parsley. Confession: eggs benedict is one of my favorite brunch dishes, and after trying all the creative riffs on it (country style, crab cakes, over a waffle), I truly thought I'd seen it all. Put a couple of spoons of dark brown mustard on a plate, arrange the egg halves around the mustard, and if you like, you can even add some crispy fried potatoes or potato chips. Spread a little mustard on the egg, and eat away! These things are better the second day, when they've been kept overnight in the refrigerator. You can either warm them up in the microwave, or eat them cold.